Jeb Bush claimed that the science is unclear as to how much humans contribute to global warming. The United Nations climate change research organization, however, has deemed it “extremely likely” that more than half of the observed temperature increase since 1950 is due to human activities. At an event in New Hampshire, Bush was asked about climate change. He acknowledged that climate change is occurring, but questioned its causes. Bush, May 20: I don’t think the science is clear of what percentage is man-made and what percentage is natural. I just don’t — it’s convoluted. And for the people to say the science is decided on this is just really arrogant, to be honest with you. This suggests that the relative contributions to global warming from humans and from natural causes are unknown. Though absolute certainty on this issue is impossible, much research has gone into the question, and relatively good answers are indeed available from the U.N.’s Intergovernmental Panel on Climate Change’s fifth assessment report that was released in 2013. IPCC, 2013: It is extremely likely that human activities caused more than half of the observed increase in GMST [global mean surface temperature] from 1951 to 2010. This assessment is supported by robust evidence from multiple studies using different methods. “Extremely likely” means that the likelihood of an outcome is between 95 percent and 100 percent certain. The IPCC added that it is “virtually certain” — which means 99 percent to 100 percent probability — “that internal variability alone cannot account for the observed global warming since 1951.” In the IPCC’s Summary for Policymakers, the authors summarize clearly: “The best estimate of the human-induced contribution to warming is similar to the observed warming over this period.” In other words, the best guess is that humans have caused essentially all of the warming that has occurred. The fifth assessment report goes into more detail on specific amounts of warming. Over that 1951 to 2010 period, there was a total rise in temperature of 0.6 degrees Celsius, or about one degree Fahrenheit. Human-caused emissions of greenhouse gases such as carbon dioxide “likely” (66 percent to 100 percent probability) caused between 0.5 and 1.3 degrees C of warming in total. Other human activities such as the release of aerosols have had more of a cooling effect, because they scatter and block sunlight as it reaches the atmosphere; this effect totaled between -0.6 and 0.1 degrees C.
Natural influences, including things like changes in the sun’s output and volcanic eruptions, have had little effect — between -0.1 and 0.1 degrees C. Internal variability, which refers to natural fluctuations in temperature, also only accounted for a change between -0.1 and 0.1 degrees C.
Here’s a visual version of these numbers, from the IPCC’s report. 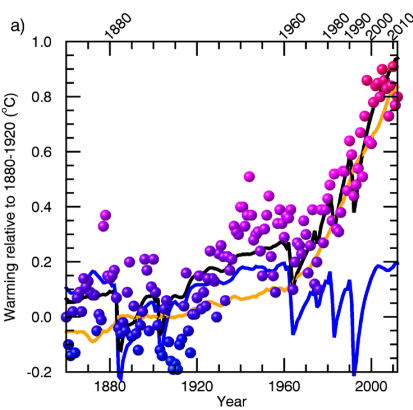 The top bar represents the observed warming since 1951 — how much hotter it has actually become, according to the planet’s numerous weather stations. 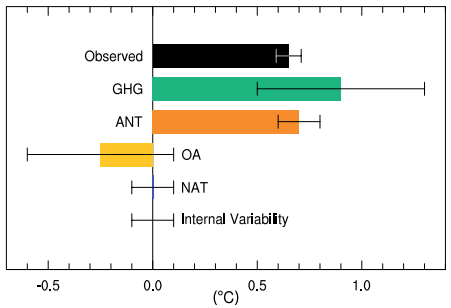 Below that in green is the warming due to greenhouse gas emissions; the yellow bar represents other anthropogenic — human-caused — activities like aerosol emissions, and the orange bar combines those two human sources. At the bottom are the relatively small contributions from natural sources like the sun and volcanos, and internal variability. To be clear, all these results have uncertainty associated with them — that’s what the lines with brackets on each bar represent. But even with that uncertainty, the human contribution to warming clearly is far larger than that of natural sources. How do scientists attribute warming to one source over another? One method is to compare what has happened to what scientists expect would happen under certain circumstances. To do this, scientists use computer models: They simulate what would happen without human activity like burning fossil fuels, then add in that activity, and see how the simulation results differ. If the actual, observable trends — that 0.6 degrees C rise in temperature, in this case — mirror what happens in the model with human activity but not without it, then that means human activity is likely responsible for the trend. The blue line represents what multiple climate models say would have happened over more than 100 years with only natural variability — basically, only a small change in temperature would have been expected. The orange line is the same models’ guess at how the climate would react to human activities like burning fossil fuels. And all those dots, and the black line fitted to them, are what actually happened. The close link between the observed trend and the models’ guess suggests that human activity is indeed causing the planet to warm up. This sort of analysis has been repeated and confirmed in several published studies, which the IPCC used in its synthesis of the evidence. For example, a study by National Oceanic and Atmospheric Administration scientists published in the Journal of Climate in 2013 found there were “detectable anthropogenic warming components” over most of the surface of the world for temperatures between 1901 and 2010, and in most cases the amount of warming was consistent with the models as well. 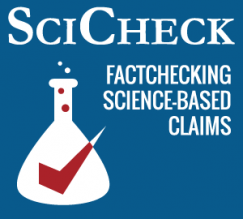 IPCC, 2013: Taken together, the combined evidence increases the level of confidence in the attribution of observed climate change, and reduces the uncertainties associated with assessment based on a single climate variable. From this combined evidence it is virtually certain that human influence has warmed the global climate system. Again, “virtually certain” means between 99 percent and 100 percent probability. Bush is correct if he means that researchers are unlikely to ever have an exact number for how many degrees are caused by humans — scientific calculations always have a certain amount of uncertainty. But that doesn’t mean that nothing at all is known on the topic. In this case, the science says that humans “dominate” the causes of global warming.